Exaco Aerobin 400 Insulated Compost Bin Review: Worth The Price? If you’re tired of messing with heavy composters and shovels, you may find that the Exaco Aerobin is what you need. 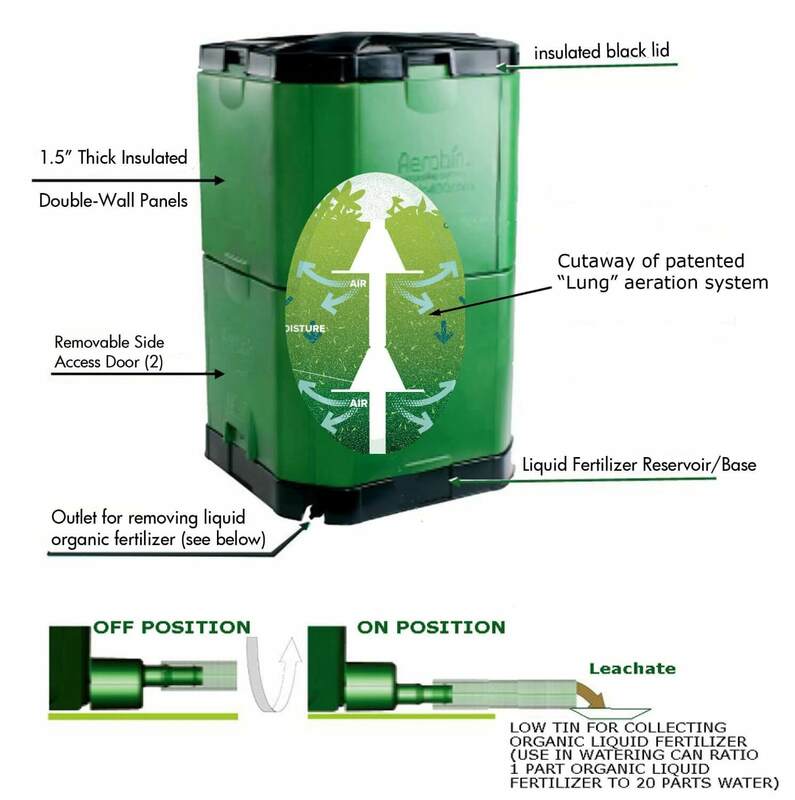 The sturdy design uses a unique, patented self-aeration process to ensure that your compost receives enough air flow to enhance the decomposition process. 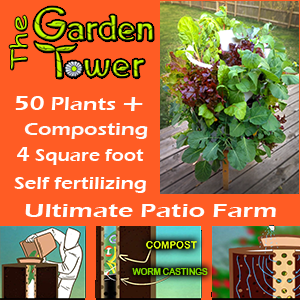 You’ll be able to get dark, rich soil-like material to use as topsoil or fertilizer for your plants. The Aerobin also creates a liquid fertilizer that you can use to water and feed your plants. The bin is heavy enough to withstand strong wind. It is also insulated, so the compost will stay warm even in freezing temperatures. This is important for ensuring proper decomposition of organic material. The heavy-duty lid keeps out critters and rain. Two access doors give you flexibility for removing the finished compost. This product is a high-capacity composter. The company claims that it can create up to 330 gallons of soil per year. The average composter only creates up to 110 gallons of soil a year. One of the tricks to creating rich soil is providing an environment with an adequate balance of moisture and air. For most products, this involves consistently turning the pile. Some products are created with a tumbling mechanism that lets you turn the bin easily using a hand crank. With others, you are required to remove compost from the bottom using a shovel or pitchfork and replace it on top of the pile. Yet other bins only allow you to mix from the top using a pitchfork. You don’t have to do any of this work with this composter. The patented internal lung delivers continuous airflow. It draws in air from outside and delivers it to the microorganisms that need it to help decompose the organic material within. The bin is made from durable plastic, which becomes heavier when filled with organic material and is resistant to tipping. The 1.25-inch walls and lid insulate the material, maintaining the heat that’s necessary for decomposition and preventing it from cooling off during the winter. This also allows the material to get hot enough to kill off harmful weed seeds. The tightly sealed bin keeps out pets, rodents and other animals. However, because it has no openings, it doesn’t allow earthworms or other insects to get in, which could help with the decomposition process. As compost is created, liquid “tea” drains to the bottom. The bin contains a spout that allows for easy retrieval of this liquid. You can spray this “tea” on or around plants to provide nutrients and keep away harmful bugs. The bin is 29 inches wide, 29 inches deep and 47 inches tall. It accommodates up to 113 gallons of soil. It’s about the size of an outdoor garbage can, and it’s tall enough that you don’t have to bend over to add organic material. You do need to bend over to retrieve liquid from the spout at the bottom, however. Automatic aeration – Just add organic material and forget about it. You don’t have to return to the bin to manually turn it or check on the compost. No manual turning – The patented internal lung introduces consistent airflow so that you don’t have to do it yourself. Sturdy – The bin is heavy, so it won’t tip over in extreme weather. Liquid fertilizer – Get as much benefit out of your yard waste and kitchen scraps as possible. A spout at the bottom of the bin gives you access to nutrient-rich compost “tea” that delivers nutrients to plants quickly and effectively. Insulated – You don’t have to worry about moving your composting bin to a sunny spot in cold weather. The thick double walls keep in the heat that’s necessary for creating effective compost. Can’t be moved – The heavy bin isn’t portable. Decide on one spot in which to place it, preferably close to the garden. Sealed against vermin – While rodents and other pests won’t bother your compost, beneficial organisms can’t enter to help with the decomposition process. Expensive – The Exaco Aerobin is more expensive than many similar styles on the market. However, it’s the only one with the internal lung that provides automatic aeration. Inconvenient spout – Because the liquid fertilizer drains to the bottom, the spout is located at the base of the bin. This can make it difficult to pour the liquid into a container. Use a shallow dish or attach a siphon to the spout for easier removal of the compost tea. Is The Exaco Aerobin Composter Right For Me? The Exaco Aerobin 400 is similar to a standard composter in that you can add organic material to the top and remove finished compost from the bottom. However, it is unique in that it contains an internal structure that creates constant airflow. Decide where you want to place the bin and begin layering green and brown organic material to begin the composting process. This bin has a large capacity, so if you don’t have yard waste to add to it, you might find it difficult to get off to a quick start. A smaller vermicomposter, like the Worm ﻿Factory 360﻿, might be better for people with less waste. We prefer this bin to the non-insulated types, but the doors that open for compost removal do let some material spill out every time you open them. Other features, such as the non-hinging lid, are not designed efficiently, considering the price. However, this composter will stand up to years of use and maintains its internal temperature well.